Nowadays, it would be hard to not notice that electronic devices have become incredibly small. The use of miniature sensors in the upcoming Internet of Things (IoT) era could enable us to develop applications that have only been seen in science fiction. However, microelectronic devices still require power to run, and energy-harvesting micro-electromechanical systems (MEMS) can be used so that these minuscule contraptions can run on ambient energy, such as that coming from mechanical vibrations. As depicted in Fig. 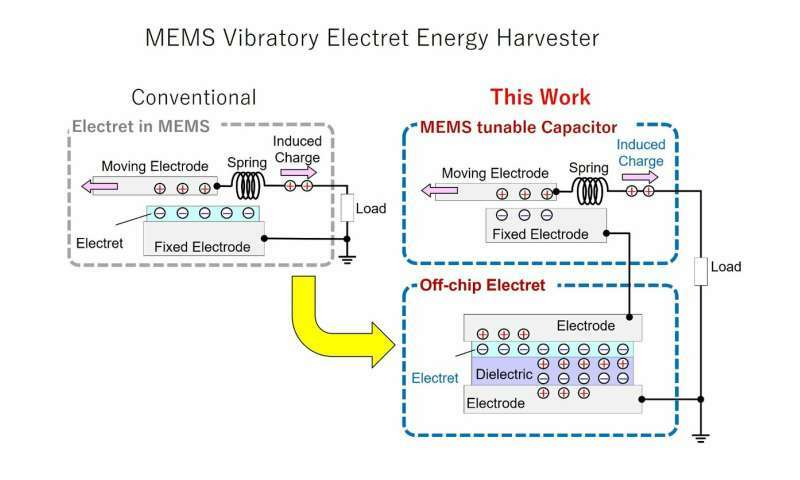 1, conventional MEMS energy harvesters use an electret (the electrical equivalent of a permanent magnet; it has permanent charge stored in it) placed in an MEMS tunable capacitor, which has a moving electrode that is pushed by ambient forces, inducing the movement of charges. Unfortunately, this design is very constrained because the fabrication processes for both the electret and the MEMS components have to be compatible. 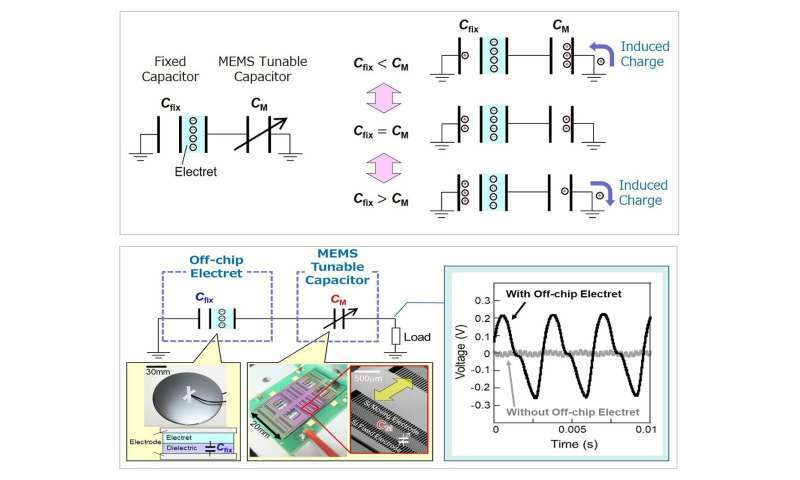 Therefore, a team of scientists, including Assistant Professor Daisuke Yamane from Tokyo Tech, proposed a new MEMS electret-based energy harvester that consists of two separate chips: one for the MEMS tunable capacitor, and one containing an electret and dielectric material to form another capacitor (Fig. 1). "This allows us to physically separate MEMS structures and electrets for the first time," states Yamane. The energy-harvesting mechanism of the device is shown in Fig. 2. The capacitance of the electret circuit is fixed (Cfix), whereas that of the MEMS tunable capacitor (CM) changes according to the stretching of the spring (caused by external vibrations). When CM becomes higher than Cfix, a movement of charges is induced and the tunable capacitor gains charge. Likewise, when Cfix is higher, charges move in the opposite direction and the capacitor in the electret circuit gains charge. These movements of charges represent electrical power that can be exploited. The left side of Fig. 3 shows pictures of the fabricated chips and a simplified diagram, and the right side shows that voltage can be effectively generated. "The proposed method can be a promising way to enhance the design and fabrication flexibility of both MEMS structures and electrets," concludes Yamane. Loosening up design constraints expands the limits for engineers and will accelerate the onset of the IoT era so that we can reap its benefits.